An account by a 25-year-old Chinese man. Being a young adult subjects you to inappropriate questioning about your relationship status in the workplace. It became known that I had been single for a while, four years to be exact. A friend at work casually brought up the topic of setting me up on a blind date during lunch. He asked if I had dated anyone outside my race. I said no and immediately knew he was setting me up with a non-Chinese girl. I had never been attracted to someone outside of my race, but I didn’t want to sound like a racist either. So when I was asked about the blind date again, I agreed. Leading up to the date, I wasn’t given any clues, pictures or numbers. 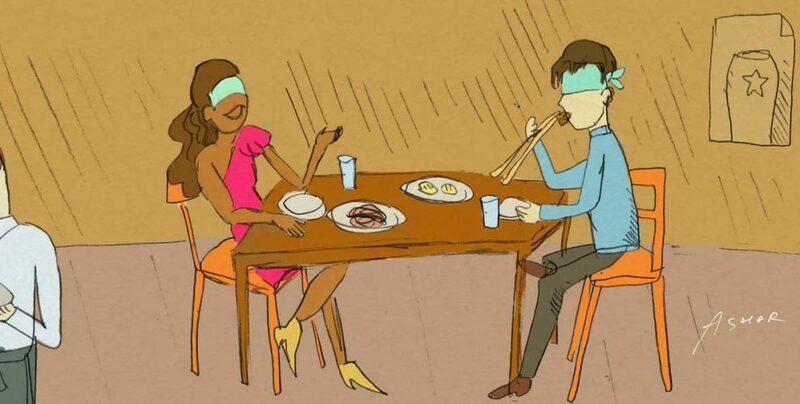 He took the blind aspect of the date very seriously. I was given a fake name of the girl, which I later found out to be the name of his domestic helper. Our blind date was set up on a Friday. We would go to a location determined by my friend with no points of contact except through him. It was an uneasy situation but I trusted him. When the day rolled around, I dressed a little better than usual by putting a neatly pressed blue shirt over my usual T-shirt-and-jeans get-up. That day, various colleagues kept telling me how excited they felt for me. Maybe they needed to be set up themselves. The mood in the office felt nice with its winded-down Friday vibes, so I lingered past work hours. 7.30pm, Orchid Hotel, Tanjong Pagar was when and where we were to meet. I felt butterflies in my stomach as the time approached, but my fears were drowned when I met her. She beamed in a red dress, flats and a handbag. I knew it was her at once because she was the only Indian girl outside Orchid Hotel. After an ice-breaker conversation about how our day had gone, we hopped into a Korean restaurant. She had an upbeat personality, which made the night much smoother. It would have been a nightmare if she was difficult to talk to. We laughed after learning each others’ real names and got down to ordering. The restaurant was packed at dinner time but not too noisy. Korean patrons spoke in hushed tones with the occasional ping of beer glasses. I was surprised by how comfortable she was with herself. She talked cheerfully, her voice and laughter filling the small joint, which made the introvert in me quiver a little. We ordered fried chicken, spicy soup noodles and fried pancakes. Our conversation centred around casual and appropriate topics two people on a blind date should talk about. In other words, we talked a lot, but not about much. I tried to find points of commonalities between us to keep the conversation going. She works in advertising, which I am interested in. I also found out she was Catholic and a lector in church, somebody who reads bible lessons during service. Unfortunately, I had abandoned my faith as a Catholic a few years prior. It was a strange, perhaps unsettling phase for me as I walked away from a community that had always been there for me. I could not reconcile an absurd faith in miracles and a personal God who didn’t seem to be there for me. It became clear that she was an optimist, and I, a pessimist. Our differences went beyond our skin colour. It seemed like a natural succession to go for drinks after dinner. We went dutch with the bill and hopped into a bar, Fyr, because she had a one-for-one discount there. We continued to chat cordially for the next hour and a half, though I don’t remember what we talked about. As I swirled the last bit of colourless gin in my glass, I felt a sense of fatigue. It signalled the day and week had come to an end. We decided to call it a night, but not before exchanging numbers. I hugged her goodbye at about 11.30pm, just in time for the train. After rolling out of bed the next morning, I decided to thank her for the night we had. We texted casually through the weekend, mostly about how our mutual friend who set us up would feel. After mulling about the experience over the weekend, I thought it would only be appropriate and honest to provide closure. “I don’t think we are romantically compatible,” I texted her close to Sunday evening. She accepted it with grace, but my colleagues gave me a hard time about it when they saw my texts the next week. “Why you go out for one date expect to want to get married is it?” A colleague yelled at the pantry. They need to leave me alone. I felt the lack of chemistry at the start, but I went through with it. Perhaps for men, we need to feel the buzz of excitement before dating someone. If there were sparks, we would have touched each other at the bar, but I found myself just gulping my gin. These days, when busybody colleagues ask me how my date went, I tell them that it felt more like going out for dinner with a friend, which might not be a bad place to start.